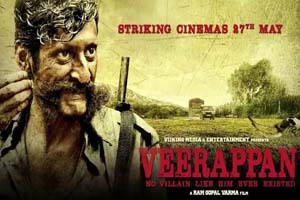 Veerappan is a 2016 Hindi language biographical film directed by Ram Gopal Varma and produced by B.V. Manjunath, Raina Sachiin Joshi. The film is based on the real-life Indian bandit Veerappan. The film stars Sandeep Bharadwaj, Sachiin J Joshi, Usha Jadhav, and Lisa Ray. The soundtrack of film is composed by Jeet Ganguly, Sharib Sabri, Toshi Sabri and lyrics are penned by Manoj Muntashir, Manoj Yadav. Here is the link of all the songs lyrics and videos of Veerappan.